"These waffles are dense and delicious! Perfect for a fall morning. You can substitute any squash. These are also a perfect way to get your kids to eat veggies! Serve with cinnamon cream syrup (recipe on this site)." Place acorn squash, cut-side down, in a microwave-safe dish; add enough water to reach a 1-inch depth. Cook squash in microwave until tender, about 20 minutes; allow to cool until easily handled. Scoop meat out of squash and discard peel. Combine flour, baking powder, cinnamon, ginger, salt, and cloves in a bowl. Blend squash meat, brown sugar, milk, eggs, and vegetable oil in a food processor until smooth; mix into flour mixture until batter is smooth. Preheat a waffle iron according to manufacturer's instructions. Spray the inside of the waffle iron with cooking spray. Pour 1/4 to 3/4 cup batter (depending on size of waffle iron) into waffle iron and cook according to manufacturer's instructions. Repeat with remaining batter. I cook all my acorns at once, puree with a little butter and brown sugar, and freeze in baggies to use throughout the winter. so, so tasty! I cook for one, so I split the recipe in half and still had tons leftover to freeze for later. When my garden is overflowing with butternut squash this is my go to recipe. It's easy to make these waffles and freeze them for use in the winter. My kids eat them up! 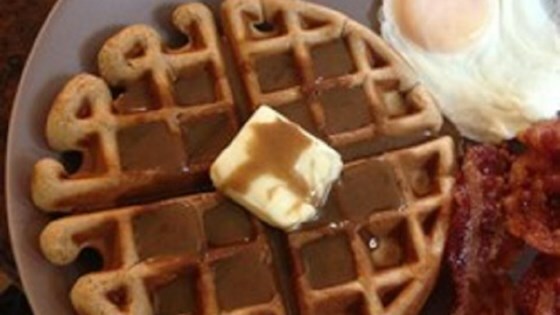 These waffles were easy to make and unbelievably delicious and moist! Delish. I used acorn squash.